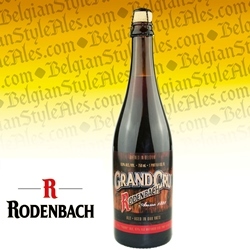 Rodenbach Grand Cru is a sour ale that is 2/3 aged "mother beer" - which has matured in oak at least two years - blended with 1/3 of a younger, sweeter counterpart. Considered the current benchmark of the Flemish sour ale style, the brew pours a dark ruby brown with a small beige head. Aromas include vinegar, ripe stone fruits, candy sugar, berries, sour apple and red wine. Taste follows a similar profile with sour fruits and berries dominating but equally important are balancing notes of sweet caramel, molasses, oak, vanilla, cheese and chocolate. The mouthfeel is medium bodied and creamy with lots of carbonation and a well hidden 6.0% ABV. The finish is dry, lingering, and tart. Pairs well with shrimp and other seafood, or try with rich, higher-fat poultry like duck; also pairs well with rich, savory game meats.